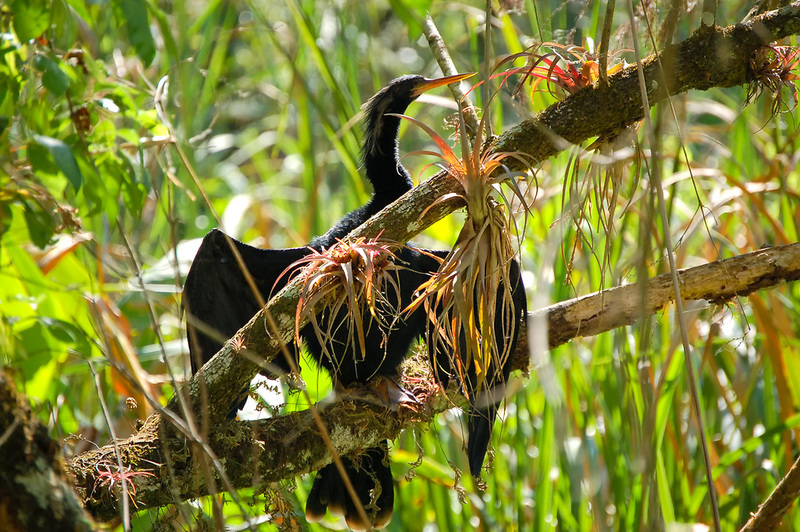 Because anhingas don't have the oil glands found in other aquatic birds like ducks, gulls, swans, etc, when they come out of the water, they will need to dry their wings in order to fly. The advantage of not having this seemingly important oil so essential to buoyancy is that when underwater, the anhinga becomes an extremely fast and agile swimmer and a very efficient fish hunter. Throughout the Gulf Coast, this is a very typical sight: an anhinga perched above water, wings spread drying in the wind and heat. This adult male was photographed in the Six-mile Cypress Slough in Fort Myers, Florida.